For over 25 years Everlast Blacktop has been leading the way among driveway pavers in the Rosemont and surrounding areas when it comes to customer service and satisfaction. Our reputation as a dependable driveway paver company is unmatched in the industry. Because of our longstanding commitment to excellence, our customers know when they call Everlast Blacktop for their driveway paving needs, they will get exactly what they want and expect. Affordable prices and customer satisfaction are what makes Everlast Blacktop is the leading company among driveway pavers in and around Rosemont. Located in Cook County, Illinois, directly northwest of Chicago is the up and coming village of Rosemont. The village and its 4,202 residents are considered an edge city and entertainment hub boasting nearly 50 restaurants, 15 hotels, convention centers and sporting arenas. The residents of Rosemont also enjoy the beauty and long-lasting durability of asphalt driveway paving and driveway sealcoating services from Everlast Blacktop. Custom blacktop driveway designs for residences and driveway paving are what set us apart from other driveway pavers in the Rosemont area. 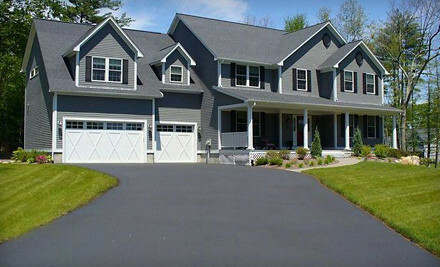 At Everlast Blacktop we have worked with many residents to create a one-of-a-kind residential driveway paving project. When you need an asphalt driveway or fresh blacktop driveway for your home or business, the premier driveway pavers to call are Everlast Blacktop. You can rest assured that your driveway sealcoating will be completed with excellence and 100% satisfaction regardless of the size of the project. The durability and long-lasting beauty of a new blacktop driveway or asphalt driveway will bring years of convenience and enjoyment to your home when you call us today at (630) 855-5572.